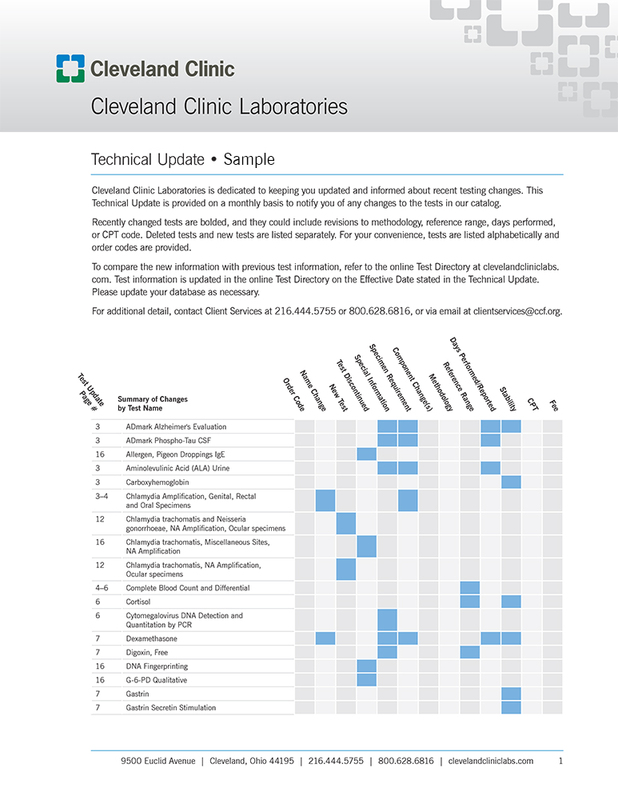 Cleveland Clinic Laboratories is dedicated to keeping our clients updated and informed about recent test changes – and we are pleased to provide this technical update on a monthly basis. Recently changed tests are bolded and could include revisions to methodology, reference range, days performed, or CPT code. For your convenience, tests are listed alphabetically and the order and billing codes are provided. If you wish to compare the new information with previous test demographics, please refer to the Test Directory. Deleted tests and new tests are listed separately; please update your database as necessary. For additional detail, please call Client Services at 216.444.5755 (local) or 800.628.6816, or email ClientServices@ccf.org.